Gypsymade is committed to creating one-of-a-kind products with low environmental impact. Our company aims to provide a unique alternative to mass-produced disposable items that commonly end up in landfills. All Gypsymade furniture is refurbished in Brooklyn using top-quality sustainable and vintage materials. Our upholstery is done using natural horse hair and cotton for padding. In order to decrease waste, we re-use as many previous parts of the original furniture as possible. Our all-natural paint is handmade in NYC without chemical dryers. Organic ingredients are used to strip and clean surfaces. Rust on old hardware is removed with vinegar and a brush. 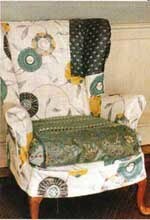 Fabrics and animal hides are vintage or come from responsible European factories. Gypsymade strives to be as conscientious as possible and the more we learn the more we can improve our methods.